Adorable family! Adorable finishes! This young and energetic family took this out-of-date space and made it work for a modern day family- and gave it plenty of style to boot! 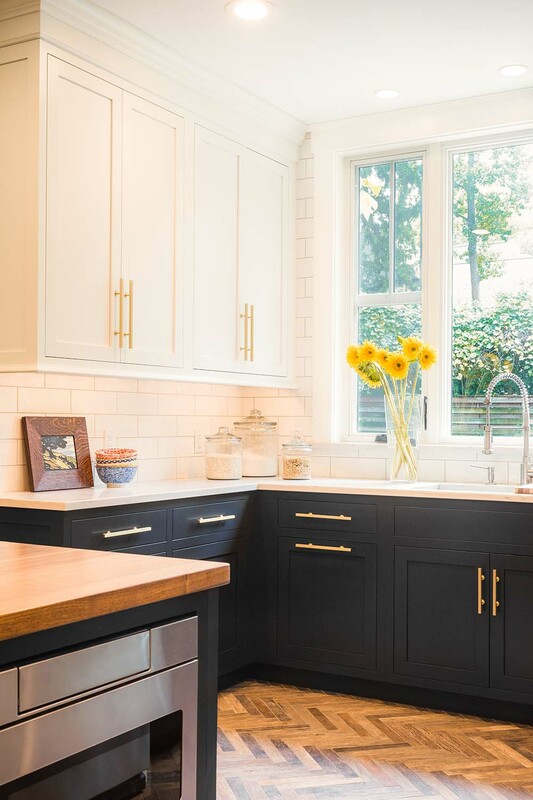 The existing kitchen in this historic home was a dark and crowded 60 sq. ft. kitchen. You could almost wash dishes at the sink, stir a pot on the stove and get milk out of the fridge all at one time! Right off of this kitchen was a fairly large kitchen table area that under-utilized the space. We needed to make the total 185 sq. ft. space work as one large kitchen. In order to take advantage of the total space, we closed off a side window in the eating area (that was a view of the side driveway and neighbor’s house). That created wall space to accommodate appliances and enlarged the work triangle. We moved a radiator to open up the entry into the dining room to allow space for an island and seating there. In opening the ceiling to eliminate the ceiling height changes from one area to the other, major damage to the porch above the old kitchen was found and all new framing had to be built. Since we closed off a side window, we opened the sink window up as much as possible to let light in and to have a view of their beautiful backyard space. Selecting materials for this client was where all of the fun really began. The goal was to respect the age of the house, but also the client’s willingness to be more adventurous with the materials. We wanted an eclectic mix. The upper cabinets we kept in a classic Mouser Linen White and paired them with lower cabinets in Inkwell Blue Black. Open wall with etched marble accent tile features reclaimed wood shelves and iron metal brackets. 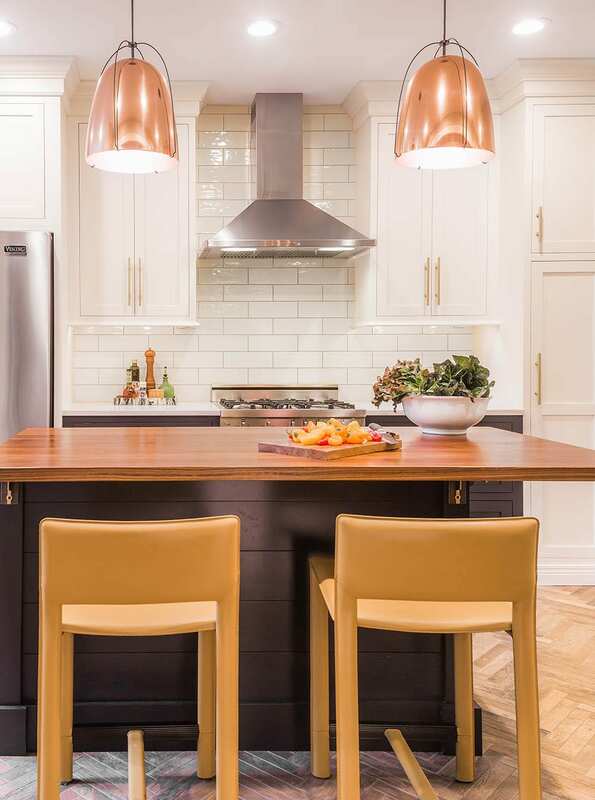 Bright stainless appliances mixed with Copper accent lighting and Brushed Brass hardware continued the mixed metals theme. Classic subway tile (but in a larger size) frames out the new window and adds interest with its’ wavy texture and grey grout lines. Craft Art Black Walnut wood tops for the island repeats the wood theme and adds warmth while Difiniti Quartz marble-look perimeter tops give a nod back to the classic aspect of the home. The cherry on top of the whole design is the handsome wood-look herringbone floor tile! It grabs your attention as you walk in and also serves as the perfect backdrop for the rest of the materials. The finished kitchen is a real reflection of the stylish and adventurous family that lives there!